There is a lot to like in the cycling sections of this Annual Plan. One can always quibble, ask for more, but we are fortunate to have an occasion to be thankful. CCC is going to need a great deal of support and frankly, pressure, to be able to follow through on the proposed level of funding for cycling. With the downtown dinosaur landlords wanting more cars and parking, with some residents along proposed major cycle routes more focused on loss of parking then road safety and quality of life the NIMBY brigades will be pushing back on this plan. Councillors need to hear from LOTS of voters that the support for cycling is real. Getting out on your bikes and getting friends, family and neighbours out on theirs will also help, especially if it motivates them to make a submission in support. Council is delivering greatly improved infrastructure thanks in part to the need to spend the central government supplied Urban Cycleway funds before July 2018. If the NIMBY’s successfully stall cycling infrastructure tens of millions will be lost. 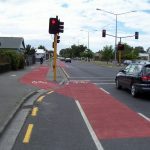 Ratepayers will be stuck with the full costs as the demand for cycling infrastructure will not go away. What is on offer here was literally unthinkable in the past when funding for cycling was around 0.5% of the transport spend, sometimes reaching 2% in a very, very good year. With allocations over 10% of proposed transport funding this plan goes some ways to making up for the decades of under funding. To keep this momentum going will require every current and would be cyclist to write a submission directly in support of the cycle funding offered and the polite request to spend even more. Funding cycle infrastructure makes sense. Cycling keeps local dollars local. Without the constant drain of dollars to buying cars, parts, petrol, roading repairs and new roading infrastructure there is more for people to use locally, building our economy and community. Cycling is a net benefit to public health. With fewer of us overweight, diabetic, suffering from heart disease lives are benefited. Councillors will hear many complaints of why dollars are better spent on roads and parking, yet both only increase car usage and congestion. Remind Councillors that the best way to reduce congestion is to get people on bicycles, on foot and on public transport. Cycling infrastructure is far cheaper than motorized transport infrastructure and parking structures. The savings means CCC needs fewer ratepayer dollars. In the Mayor’s letter to the plan she relates how the floods and now forest fires have stretched the Council and consumed funds. Ratepayers are hurting and Council is striving to minimize the pain. Cycling is an easy win in the fight against catastrophic climate change which is responsible for more climate events which cost ratepayers dearly. If we all take the attitude of letting the other guy ‘do it’ we will all suffer. Include your name, address, email. Let them know if you wish to also make an oral submission to Council and then include your phone number for scheduling. Please declare if your submission represents a group. There are many other issues in this document on which Council would like to hear from ratepayers. Even if you only make a submission on cycling the summary is well worth the read.